When I was first introduced to dinosaurs over 50 years ago there were only one or two books available and they were in black and white with limited illustration. Dinosaur films were startling but the animation was hardly lifelike and dinosaurs eating humans was geologically unsound – as man and beast were separated by almost 60 million years. Now we have a new type of book on the market using a new technology that enables the webcam on your computer to recognise pages of the book and trigger the appearance of 3D animations that come to life! The new technology is called Augmented Reality and you are able to control the 3D images that appear on your computer screen. The book itself will be noted for it’s beautiful cover, which is soft to the touch and brightly coloured with your focus brought quickly to a reptilian eye that stares at you from centrepage! There are no page numbers but the inside cover and the first two pages tell you how to install the software, give tips on how to use it and advise you to contact carltonbooks.co.uk if you experience any problems. When you see a black square with a symbol looking like a dinosaur eye you are on an AR page. Look out for monsters! After the title pages there are twenty double page spreads listed as: Meet the Dinosaurs; Old Timers; Super Heavy Weights; Diplodocus (AR); Killing Machines; Micro Monsters; Tough Guys; Stegosaurus (AR); Sprinters and Plodders; Scary Oddballs; Quetzalcoatlus (AR); Ferocious Beasts; Power Packs; Big Heads; Pentaceratops AR; Longest and Tallest; Master-Minds; Extreme Eaters; Tyrannosaurus AR; Death and Extinction followed by a Glossary and answers to the quiz questions posed on the Masterminds pages. Each spread is beautifully illustrated with a mix of full colour reconstructions, excellent line drawings and photographic images. Facts and descriptive notelets fill each spread. They are succinctly written and provide abundant details on your favourite animals. 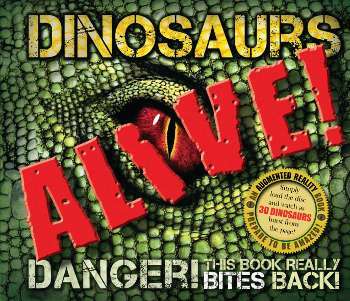 The book would be very good value without Augmented Reality but it is the sight of dinosaurs acting fierclesly, hunting for food or fighting each other that will earn Dinosaurs Alive a special place in your book collection. PC Hardware: a webcam, CPU: Intel Pentium 4.2GHZ or above or AMD equivalent, RAM: 1GB memory, Graphics card: most graphic cards and onboard chipsets are suitable (e.g. Nvidia, ATI and Intel). Software: Windows XP SP2 or above, Windows Vista. Mac Hardware: a webcam, CPU: Intel Core Duo 2.4GHZ or above, RAM 1GB memory, Graphics card: Nvidia, ATI or Intel. Software: Mac OS 10.4 and 10.5.